Monarch Caterpillar or Two-headed Monster? Caption: a monarch caterpillar crawls on to the scene with an extra head! One day I was checking up on the cats and noticed a bulky growth on one of their heads. At first, I thought that maybe he was in the process of molting (shedding his skin)... but after the noggin-sized growth still remained hours later, I decided this matter deserved further investigation. I contacted monarch expert Karen Oberhauser. Karen is the director of Monarchs in the Classroom and the Monarch Larva Monitoring Project at the University of Minnesota. After reviewing the picture above, she told me she had never seen anything like it and to keep tabs on that headstrong larva. Sounds like an easy task, but I had nine other caterpillars at the time and five of them morphed into chrysalises in one night...including the two-headed monster! That batch of five hatched within a two day period and much to my surprise, no two-headed butterfly. My chance to witness monarch history in the making....was history. Maybe next year. 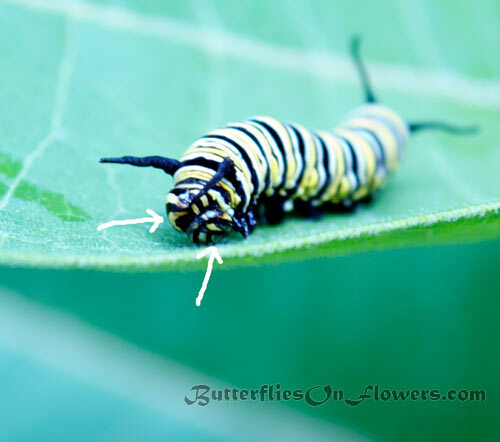 Caterpillar Facts: The long black antennae-like growths protruding from the monarch larva's head are not antennae. The real antennae are much smaller and located at the bottom of the cat's head.